MPLS is one of the topic where there is too much entry barrier as far as information is concerned. You have to deal with new protocols, different label types, MP BGP, VRFs, etc. on top of the fact that we don’t get exposure to it in our day to day networking (except if you work for an ISP). When I was taught MPLS the first time, it was very difficult for me to visualize (I rely heavily on visualization to understand a topic) the flow as labels had been flying all over the place and pushed and popped and what not. So this is my attempt to explain MPLS VPN by tearing open the packets and showing you what takes place across the network. I will try my best to make it as graphical as possible. The topology consists of 5 7200s as represented in the diagram. The ip addressing of the links are as mentioned in the diagram. OSPF is running on all links of Service Provider routers using network 0.0.0.0 255.255.255.255 area 0 command. In order to keep the topology simple, I have kept 2 CE routers, 2 PE Routers and a single P router. The PE-CE routing protocol is EIGRP. I will not explain the configuration as it is obvious from the diagram. I will post the configuration though at the end of the post. Also, I will not touch the CE part as that will be moving away from the topic as it does not run MPLS. We are assuming that all layer 3 reachability in the ISP domain is up so that we can concentrate on LDP. We have enabled LDP on all interfaces of Service Provider. Just like OSPF, LDP also uses the highest ip address of a loopback interface as router ID. In the case of the P router, there was no loopback, so it took the ip address of the highest addressed interface. The disadvantage to this is if the interface connecting to PE1 fails, so will LDP neighborship between P and PE2. The labels originated by the 3 MPLS enabled devices will be as follows PE1 1000-1999, P 2000-2999 and PE2 3000-3999. This has been done to know which routers originated which Labels to ensure simplicity. From the above capture taken between PE1 and P, we come to know that PE1 initiated the LDP session with P because it had the highest router ID amongst the 2. Also, PE1 initiated a TCP session with P on destination port 646 which is the port for LDP. You can see the session establishment in the capture with SYN, SYN ACK and ACK messages. After all the messages are exchanged, the session is established and comes the time for Label exchange. The labels generated by LDP are used to transport packets across the MPLS Network and that is the reason they are called Transport labels. We are not running ipv4 BGP as we do not require it. We are only running MP BGP between PE1 and PE2 as this required to exchange customer labels. The VRF for the customer is “cust” with RD = 100:1 and RT = 100:1. Now that we have seen the 2 types of labels i.e. Transport and VPN labels, we will see how the 2 labels work together to transport packet to the destination. For testing this, we will send an icmp packet from CE1 to CE2. I am pinging from the host facing interface on CE1 to the host facing interface on CE2. When we enter the above command, an icmp packet is created with source ip address of 1.1.40.1 and destination ip address of 192.168.10.1. When this packet reaches PE1 on a VRF enabled interface, the VRF routing table for VRF “cust” is checked and the destination address of the packet is matched. From the “sh ip bgp vpnv4 vrf cust labels” output on PE1, we see that 192.168.10.0 should be encapsulated with outgoing label of 3003 and the next hop is 100.100.100.2. 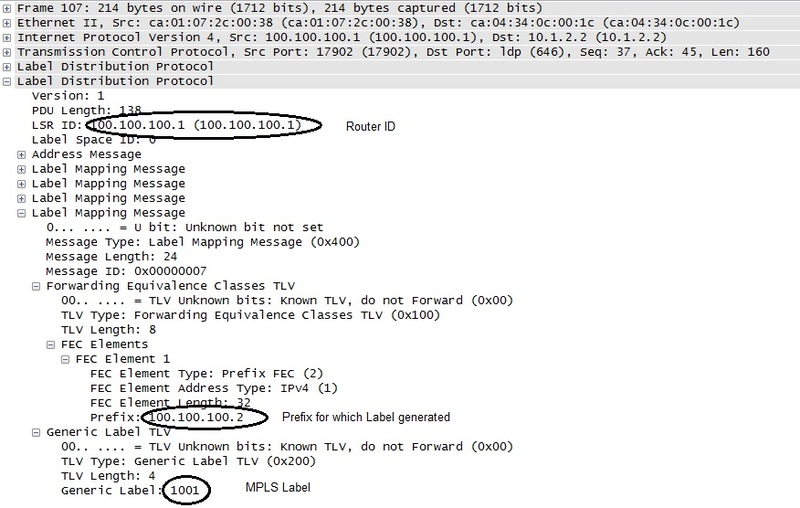 The label value of 100.100.100.2 can be obtained from “sh mpls forwarding” command on PE1. The outgoing label is 2001 so the packet is encapsulated with an outer label of 2001. On the return journey, the source is 192.168.10.1 and destination is 1.1.40.1. 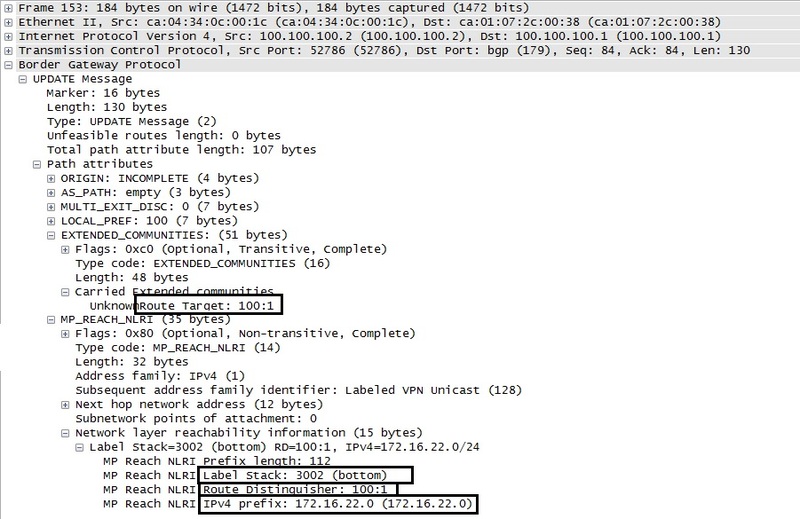 When this packet reaches PE2, the destination address of 1.1.40.0 is matched with a VPN label of 1003 from the BGP Label table. The next hop of 100.100.100.1 is reached via a Transport label of 2000 from the MPLS forwarding table. The packet created is as seen in the below given capture. On reaching P router, the outer label is stripped due to PHP and the traffic is sent out the interface connecting PE1 to P. This can be seen in the below capture. When this packet reaches PE1, the label of 1003 is utilized to send the packet out interface connecting PE1 to CE1 with a next hop 172.16.11.2 and the label is stripped. This is as per the sh ip bgp vpnv4 vrf cust labels output on PE1. The packet reaches the destination and you see the reply. This entry was posted in Everything Cisco and tagged capture, explain, graphical, implicit null, Label, mpls, packet, Transport, VPN by samirsogay. Bookmark the permalink.